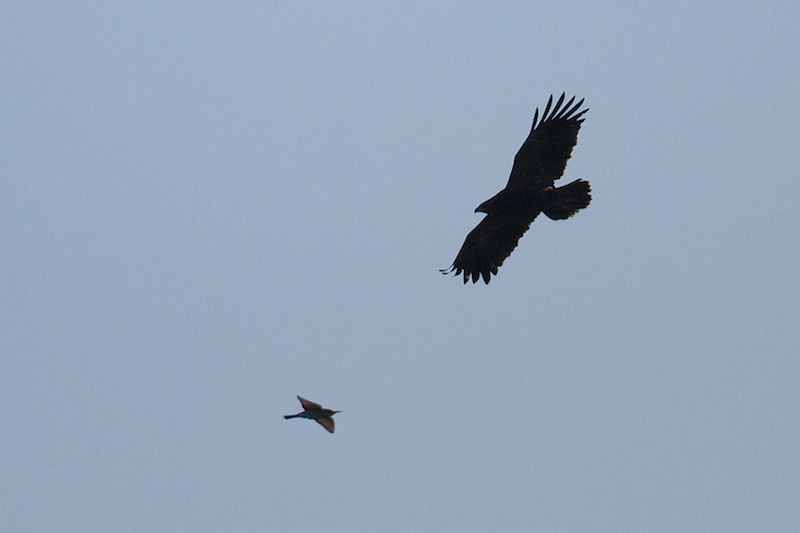 The 2010 Batumi Raptor Count is now halfway so we bring you a longer update than usual. Let´s start with the migration monitoring so far. In general weather conditions have been rather good with only few days with continuous rain. As such reasonable numbers have been recorded on a daily basis, often exceeding several thousands of raptors. In comparison to last year the good weather during mid-september has allowed for a lot of Steppe Buzzards Buteo buteo vulpinus to start their migration quite early. In 2009 it took over a week for this species s to follow the last peak of Honey Buzzards Pernis apivorus whilst in 2010 the bulk of buzzard migration (Pernis & Buteo) that typifies the Batumi bottleneck has thus been of a more continuous nature. Also Black Kite Milvus migrans has been migrating in good numbers, often in homogenous flocks during the first hours of daylight, preceeding the flight of buzzards. Since the last update on September 13th Steppe Buzzards have been increasingly numerous with an estimated number of 10.000+ and 20.000+ birds on September 16th and 17th respectively. Because of this year´s relatively large overlap in migration of Steppe Buzzards and Honey Buzzards it is not straightforward to record species numbers precisely. However, the fact that BRC is no longer monitoring Steppe Buzzard migration has allowed for a more rigorous check of the majority of buzzards for detecting late Honey Buzzards other species. As a result we are excited to see our new counting protocol proves to be the improvement we aimed for, in the sence that priority species like Honey Buzzard are being counted more efficiently. Along with the large numbers of this week came a lot of other species as well. Large Aquila species have started to cross the bottleneck in good numbers with several dozens of individuals on a daily basis. Typical for Batumi these are mostly Lesser Spotted Eagles Aquila pomarina, but also several Steppe Eagles Aquila nipalensis and Greater Spotted Eagles Aquila clanga have been observed. And whilst the migration of Booted Eagle Aquila pennata continues at a steady pace (some hundreds are seen on good days with 1.100+ on the peak day) Short-toed Eagle Circaetus gallicus is now also building in numbers with several dozens of these birds seen in the last few days. Scarce or rare species breeding north of the bottleneck like Egyptian Vultures Neophron percnopterus caused some excitement with seven birds during the last two days, including several adults. Likewise, other more scarce and rare birds were seen with several individuals per day on some occasions. Good examples are typical broad-front migrants such as Osprey Pandion haliaetus and Peregrin Falcon Falco peregrinus. So far also two Saker Falcons Falco cherrug have been counted. As far as exceptional records are concerned Crested (Oriental) Honey Buzzard Pernis ptylorhynchus continues to surprise this year. Since the last update another adult male bird was seen very well, which is the 4th bird of the season! The young Belgian naturalist Jan Ranson managed to get some very good pictures indeed, showing just how well the bird was observed. Allthough the position of the bird in this photo does not allow you to see the underwing coverts you may note the diagnostic dark eye and broad bands in the tail pattern of this species. It should be clear that around this time of year raptor diversity is peaking in Batumi because of the overlap in phenology of the majority of species. In summary, we have lately been looking at the transit from Honey Buzzard migration ´spiced up´ with harriers to the migration of Steppe Buzzards with good numbers of eagles. And whilst several species like Eurasian Sparrowhawk Accipiter nisus and Levant Sparrowhawk Accipiter brevipes are no longer counted according to the new monitoring protocol the often high observation quality naturally continues to entertain our counters. As we reported previously in this blog several students have again been enjoying some training in Batumi this year. Because regional students mostly have limited means for travel and education materials our difficulties in locating funds this year confronted us with limited education potential for 2010. Therefore only a few regional students have been with us this season. They have however proven to be exceptionally motivated students and quick learners! 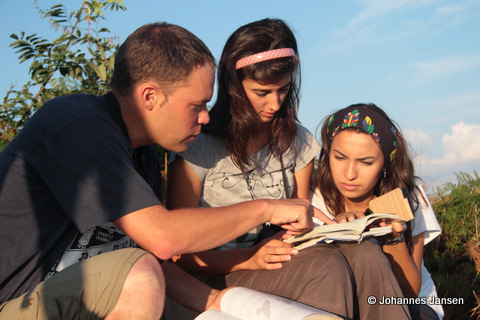 For a stay of only two weeks, the knowledge and understanding they have acquired on raptor identification and the principals behind migration monitoring has impressed both counters and coördinators. From the start of their stay we explain our monitoring objectives and the ideas behind this with some presentations. Identifying raptors starts with recognising families or genera, age classes … The basics for this are also explained through presentations followed by hands-on experience on the stations. BRC promotes self-study by offering literature to students whilst combining this with active training by experienced students from Europe on the counting stations. This year this included many motivated volunteering students from Sweden and Belgium. Discussions and debate are an important aspect of learning. By integrating our students in teams with counters of different backgrounds they have access to all this knowledge and experience. At the end of the day both counters and students should enjoy a well deserved break. Migration counting may be serious stuff, but being on holiday also means there should be time for everyone to get some ´easy-birding´ in the region, visit Batumi or to enjoy a drink or a visit to the disco. As we state on our website BRC is active in promoting the migration bottleneck in Batumi to other researchers. Most noteably for 2010, the Belgian ringing team of the Cinerea Bird Working Group has had tremendous success with their pilot project in the Chorokhi Delta that finished today. As we mentioned in previous updates, some exceptional species were recorded from a birdwatcher´s perspective including a new species for Georgia: Lanceolated Warbler Locustella lanceolata besides many other good records like Blyth´s Reed Warbler Acrocephalus dumetorum and Sardinian Warbler Sylvia melanocephala. However, the ringing project has also been a success from a scientific viewpoint as many thousands of birds have been ringed of over 75 species during the last month. Furthermore there are good prospects for follow-up next year whereby the 2010 ringing camp was a good learning experience for the people involved. Also two students from the Ilia Chavchavadze University in Tbilisi have managed to take samples of many birds for the purpose of their thesis research. We wish them all the best in managing and reporting their findings. The results of the ringers will be reported in the near future by themselves. In any case we can say their results illustrate the importance of the Chorokhi delta as a stop-over site for migrant birds at the Eastern Black Sea. We will report on these publications on this website as soon as we can. Their analysis will also include some of their findings on the hunting activity and other disturbing factors in the Chorokhi delta and the threat this poses to migrant birds, not-threatened species and endangered ones alike. For now, we congratulate Joost Mertens, Wim D´Haeseleer and their team for their tremendous efforts of the last month, the respectfull and patient manner in which they dealt with hunters and the wonderful birding experience they provided many of our counters with when visiting the delta. We hope their success will inspire more people to take part in research and conservation in the region. To end this larger than usual update we may conclude that so far BRC 2010 has continued the succes story of previous years, despite some difficulties and challenges where logistics are concerned. We thank everybody involved in making this possible, especially our local partners PSOVI and GCCW with whom we have enjoyed our coöperation, working on a long-term future for the BRC conservation programme. With this update we would again like to express our gratitude to all of the counters who make it possible to monitor migration at Batumi and also Kazbegi this year. When weather turns bad during migration, birds often only stop for a short period before continuing their journeys. Since this can be a matter of minutes it is of the essence to wait nearby the stations in order to record such events. This may seem strange, but for the purpose of research ´null records´ are equally important as those of intense migration. There have been a couple of days where our team´s patience was tested like this. We are however gratefull to find such hospitality among the local people who continue to offer their help in times of need. The gratitude and friendship of the team thus goes to Ilia, Elsa, Hamlet, Rolandi, their families & others! As far as we are concerned they truely represent all that is so wonderful about the Georgian people. We will continue our brief updates next week. Thank you for reading!